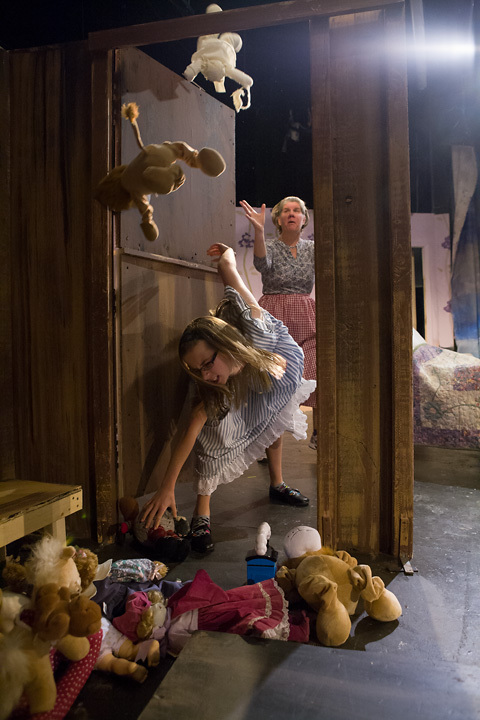 The last play of the Village Church Community Theater’s 2011/2012 season is The Velveteen Rabbit. Michele plays the lead role of Rabbit Spirit and she is fantastic in her part. Performances are May 4-6. Don’t miss it! This past Saturday was a must meet deadline for getting some photos for newspaper releases. I knew most costumes, especially the animal costumes, wouldn’t be available yet, so I had to focus on something different. Perhaps the most action packed scene is one in which Andrea (or Andrew in the script, if played by a boy) throws a fit since she can’t find her favorite china dog. Toys are coming flying out of the toy closet, and nurse Nana tries her best to contain the chaos. I positioned myself down low inside the toy cabinet, pre-focused, and just waited for the right moment. I then had about 10 seconds to get the perfect shot. As it turns out, I got a few good ones, but not the perfect one. Either nurse’s face was behind the door post, Andrea’s hair was in her face, flying toys weren’t in the right place, and so forth. So, I resorted to a little help from Photoshop, and composited a few elements from multiple photos to get what I wanted. If you feel in the mood for some detective work, see if you can identify which elements belong to which original photo. This entry was posted in Picture of the Week and tagged canon eos 60d, photography, Photoshop, theater, toys, Velveteen Rabbit. Bookmark the permalink.